This dish reflects the multicultural environment of my upbringing; it combines local ingredients and my Chinese heritage wok cooking. I learned most of my basic culinary skills in my mother’s kitchen. She taught me everything—from raising livestock and preparing animals for slaughter, through the chopping block and ending at the dinner table. This dish was invented a year after I moved to New York, with the help of my large Asian pantry, especially curry leaves, whose smell reminds me of my innocent and unbound childhood. If you can’t find curry leaves, substitute chopped fresh dill. You can also use dried chilies instead of fresh: just soak in warm water for 10 minutes before slicing. Serve with rice. Butterfly the shrimp shells: Using a sharp knife, cut along the curve of the backs, from the head to the tail, cutting about halfway through the shrimp. Remove the veins. Combine the curry leaves, chilies, turmeric and pepper and use this to coat the shrimp. Heat the vegetable oil in a wok or sauté pan over high heat. Cook the garlic and shallots until browned, about 30 seconds. Lower the heat to medium, add the shrimp and cook until they turn pink and curl up, about 2 minutes. Turn off the heat, season with the sugar and salt and serve immediately. Reprinted with permission from The Immigrant Cookbook, Leyla Moushabeck, ed. 2018, Interlink Books, 978-1-56656-038-2, $35 hb, www.interlinkbooks.com. Mei Chau was born into a large Chinese family in Malaysia, which is known for its colorful, mixed culture, dating back to the time when the first West-East trade began. She is the 10th child in her family and grew up in a small fishing village famous for its stretch of sandy beaches and for being the home of the giant turtle. 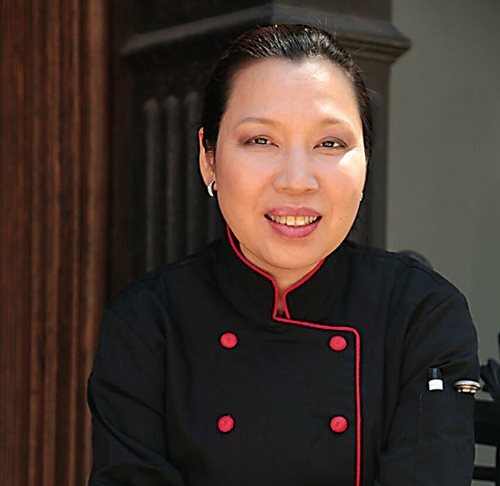 She opened her first restaurant, Franklin Station Café, a French/Malaysian bistro in New York’s Tribeca neighborhood, in 1993. Her second restaurant, Aux Epices, was opened in 2013 in Chinatown.